In 66% of American households, women are primary or co-breadwinners, yet when asked about long-term saving for retirement, women collectively set goals 50% lower than men*. If you’re self-employed, investing becomes even more complicated. If you want to save for yourself as a freelancer, you have to do the research and take initiative. If you are an entrepreneur with employees, you have to do the same for not only yourself, but for those who work for you, as well. 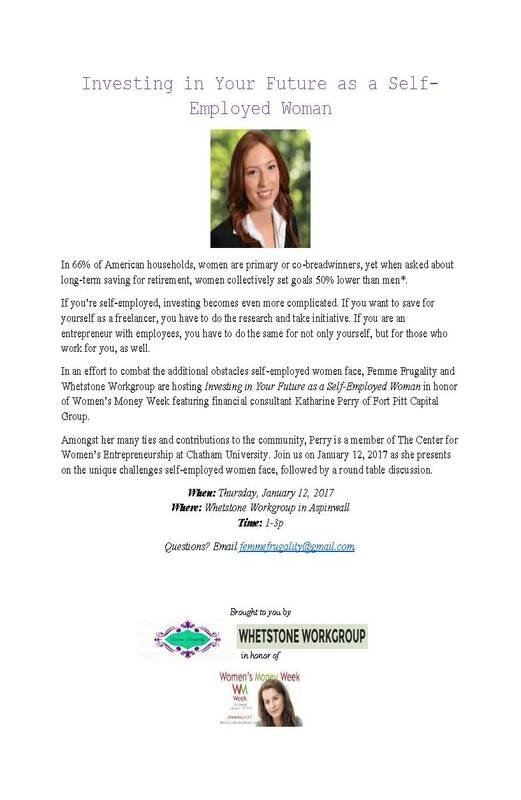 In an effort to combat the additional obstacles self-employed women face, Femme Frugality and Whetstone Workgroup are hosting Investing in Your Future as a Self-Employed Woman in honor of Women’s Money Week featuring financial consultant Katharine Perry of Fort Pitt Capital Group. Amongst her many ties and contributions to the community, Perry is a member of The Center for Women’s Entrepreneurship at Chatham University. Join us on January 12, 2017 as she presents on the unique challenges self-employed women face, followed by a round table discussion.